You need the toughest truck for the toughest jobs. For tight jobsites that demand maximum maneuverability, VHD 300 Axle Back straight-trucks and tractors are up for the task. If you need a bridge-law compliant wheelbase, the VHD 300 Axle Forward has you covered. With an easily customizable chassis, up to nine power take-off options, and a factory installed piston or gear pump, the VHD 300 is simple to tailor to your specific needs. The VHD 300 gives you a long hood daycab because when you're carrying heavy loads in rugged terrain and crowded construction sites you need a vocational truck that’s up for the job – one that’s built to last. This is where the VHD 300 helps you deliver, day after day. It’s a reliable partner that gets the job done quickly and efficiently. With 1450-1850 lb-ft torque, Volvo’s D11 and D13 engines deliver the horsepower and torque that tough vocational applications require. And, they're more efficient than ever thanks to a standard common rail fuel injection system gets the most power out of every drop of fuel. Plus, every VHD comes standard with the Volvo I-Shift for Severe Duty transmission, built for rugged jobs. When steep-grade startability and low-speed maneuverability are critical, the I-Shift with Crawler Gears is the answer for maximum GCW loads. This is the vocational sleeper others will envy. Tough enough to tackle the most demanding jobs with ease. Comfortable and quiet so you can stay alert the entire workday – and still have enough energy to enjoy your off-duty hours. That’s the VHD 400. With the 42” sleeper, you can tackle those longer routes without losing precious time, all to get you on the job faster, and keep you on the job longer. The VHD 400 is ideal for heavy or customized vocational hauling, when making your delivery on-time sometimes means spending the night on the road. The comfortable 42” sleeper means you can tackle those longer routes without losing precious time. With 1450-1850 lb-ft of torque, Volvo’s D11 and D13 engines deliver the horsepower and torque that tough vocational applications require. And, they're more efficient than ever thanks to a standard common rail fuel injection system gets the most power out of every drop of fuel. 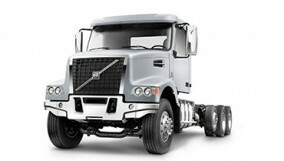 Every VHD also comes iwth Volvo I-Shift for Severe Duty transmission, built for rugged jobs. When steep-grade startability and low-speed maneuverability are critical, the I-Shift with Crawler Gears is the answer for maximum GCW loads. The VHD dashboard is optimized to reduce distraction by displaying the critical information a driver needs at a quick glance and by grouping frequently used controls within easy reach. A configurable, five-inch driver color display with industry-leading graphics works with steering wheel-mounted controls to provide key operating parameters, as well as access to system settings and configurable diagnostic aids. A dash-top tray with multiple connections provides a safe, convenient home for a driver’s many gadgets, which can also be linked to an optional in-dash infotainment system. Always in view, the instrument cluster’s clean, symmetrical layout, and diffused, light-green backlighting makes it easy to read, reducing eyestrain and fatigue.